Identified by G.B. Edwards. Vouchered at the Florida State Collection of Arthropods. I encountered this spider while doing a program for children, which included sweeping vegetation, beating branches, and spot collecting. I found this spider on the ground, but it jumped from something onto my canvas, and I don't know whether I knocked it onto the ground in the first place. 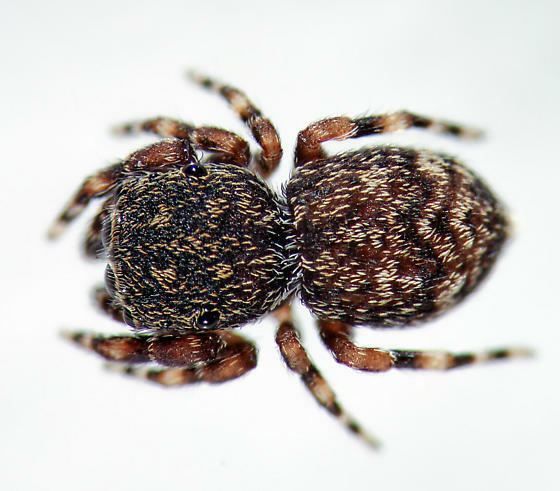 Attidops are usually found on bark and lichen in trees. I wasn't sure whether the spider was an adult, so I kept her for more than a week. She did not feed on small fruit flies or crickets that I fed her. She did attack and feed on a small silverfish, no more than twice the spider's length. She approached the silverfish very slowly, taking maybe 3 minutes to get within jumping range. She jumped from about 3mm away, failing to catch the silverfish. She attempted 2 or 3 times before climbing the petri dish above the silverfish and attacking from above, at which point she finally caught it. I also found the spider scavenging on dead crickets and fruit flies that had died on their own. After this I fed her half-squished fruit flies, which I saw her feed on once and only once. In the entire time I had her, she never made a refugium as most salticids do. She moved non-stop under light, making it difficult to get good photos of her. The one stacked microscope dorsal shot is due to cooling her in the fridge.